This past Friday I was fortunate enough to have a conversation (and virtual tour) via Skype with POPVOX‘s Marketing Director Rachna Choudry, who along with co-founder Marci Harris, was recently highlighted in Fast Company’s – 25 Woman-Run Startups to Watch. POPVOX is the newest eAdvocacy and civic engagement platform, which is currently being beta-tested and seeking investors. According to Choudry, POPVOX is based off of the Latin words “populi” and “vox,” which means “People’s Voice.” The goal of POPVOX is to ease the communication between Congress, organizations (trade, union, advocacy), and the greater public on specific pieces of legislation. Oftentimes people and organizations don’t necessarily know the best way to get their voice heard on particular issues when reaching out to Congress. Likewise, Congressional offices don’t have the most efficient methods in place to find information on constituent opinions or organizations’ policy positions on specific legislation. Choudry and Harris utilized their backgrounds on Capital Hill to envision and ultimately create an advocacy platform that would close this communications gap. 1) Public Opinion by Congressional District! – Organizations and congressional staffers have the ability to track constituent/voter views on specific pieces of legislation. Just by looking up a specific bill number – you can see what % of individuals have the majority opinion. Simply utilize a drop-down menu through the Congressional portal or a U.S. map providing numbers that show majority opposition or support by location. Right now the numbers are small by each Congressional district, but as POPVOX grows in popularity this will be the ultimate tool. 2) Individuals‘ positions on legislation are counted and have greater impact. Constituent addresses are verified and their stances on particular pieces of legislation go directly to Congressional staffers, not through a 3rd party organization. My favorite piece is the option for individuals to share their story and why they support or oppose the legislation. This is a great way for constituents to express themselves and a wonderful tool for electeds to be able to share these stories while promoting their own positions in Congress. 3) Organizations can post policy statements or press releases on specific bills. 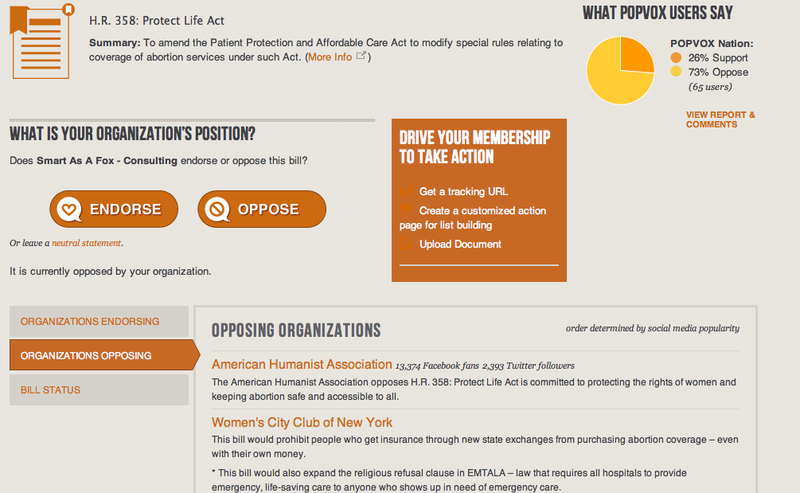 Individuals and congressional staffers can see which organizations oppose/support a bill and why. Every organization is given the option to upload a policy position for each Congressional action/bill. This is a great resource for my friends on Capital Hill who are looking to get a better idea of which organizations share a Member of Congress’ stance on a bill. 4) Launch advocacy campaigns & increase list building. 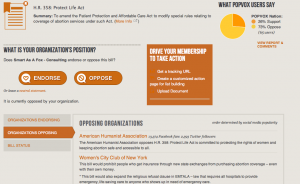 Organizations have the ability to create advocacy campaigns around particular bills by emailing their membership and directing them to POPVOX to show their endorsement or opposition to legislation. These campaigns will also be listed under the organization’s page on POPVOX, which would allow for non-members to participate as well and for organizations to collect new emails/potential members. Congress will have direct & immediate knowledge of these campaigns and/or the percentage of individuals for or against particular legislative bills or actions. While I could go on for quite awhile touting all the awesome functions this new platform has – I’d rather you check it out for yourself, by clicking on the “POPVOX: Tell Congress what you think” widget above. I strongly encourage my friends in Congress and the non-profit world (state affiliates too) to register your organization with POPVOX and get started!